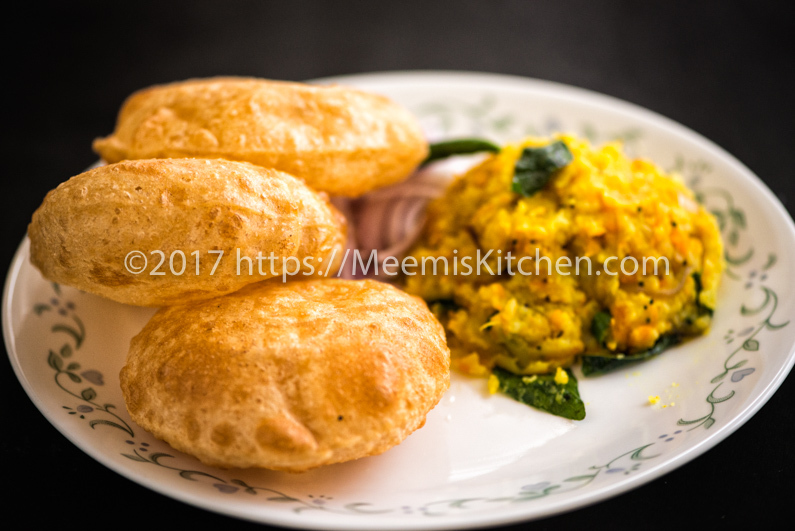 Poori Bhaji is a regular breakfast item at my home. Everybody loves the fluffy Pooris and the Bhaji. Bhaji is just mildly flavoured mashed potato which goes well with fried Pooris. It is a very popular breakfast item in India and you get different style Bhaji depending on the region. In North, they prefer gravy style Bhaji and in south the dry style. I usually make dry Bhaji as my kids love that version. You may find my Bhaji little different as I add carrots, but it tastes awesome. Must try. Kids love variety breakfast, so, I try to make it interesting for them. With the Dosa batter, I make them Pizza Dosa. Irachi Puttu instead of plain Puttu and Kadala curry, Chole Bhature, Aloo Paratha etc. are all well received at home. I prefer soft fluffy pooris to crispy ones so I don’t usually add Rava/ Sooji to the mix, but make it only with Wheat flour. If you like crispy Pooris, try my Rava poori recipe. I have a Roti maker which I had bought earlier but was never successful in making rotis, I used it to flatten my poori and it gave me awesome results. The hot press gave the best shape and also it stopped the Pooris from sticking together. So it made my job easier, or just imagine how hard it is to make 40-50 Pooris early morning for my little Army. So if you have a Roti maker use it or try Poori press. Follow the instructions to get soft fluffy pooris! Enjoy! Prep. Time : 30 mts. In a wide vessel, mix all the ingredients with warm water and work out a smooth dough with your hands. Keep it covered for 15 mts. 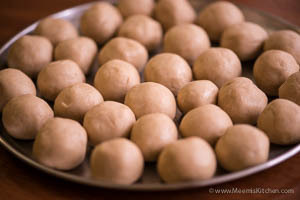 Then make small balls and shape into flat rounds using rolling pins. (Use poori press/ Rotimaker). Heat Oil and deep fry each pooris, splashing oil from sides and gently pressing on top with the slotted spoon, which helps it to puff up. Turn and fly to a golden brown and drain to a kitchen tissue. 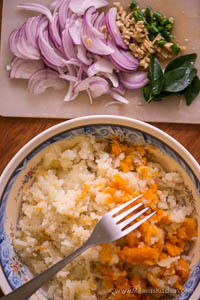 For Bhaji, boil and cook the potatoes and carrot in a pressure cooker. Once done, peel the skin and mash the potato and carrot with a fork. Slice Onions, cut chilly into rounds and chop ginger. Heat oil, pop mustards, add sliced onions, ginger, chilly, curry leaves and sauté for some time. Add the turmeric pdr and salt and the mashed potato and carrot. Mix well. Enjoy your fluffed pooris with the delicious bhaji. The Poori dough should be soft and not sticky. Add water carefully little by little to avoid stickiness. Knead well to a smooth dough. Poori should be fried in very hot oil, on high flame throughout. Or it will absorb oil. Enjoy a great breakfast with Poori Bhaji. God Bless! !